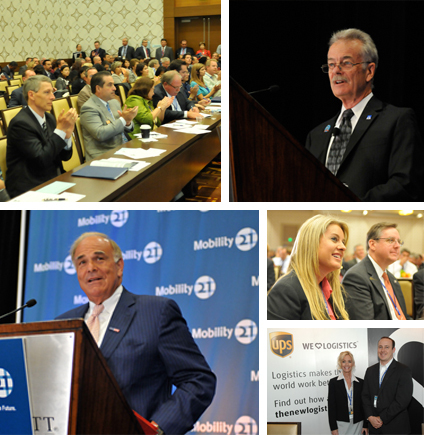 Earlier this month, Mobility 21 held the 10th annual Southern California Transportation Summit. More than 1,000 transportation, business and elected leaders converged on the JW Marriott at L.A. Live to pledge their commitment to job creation for Southern California by aggressively pursuing and delivering state and federal transportation investment to our region. This year, Mobility 21 looked ahead with a fresh perspective and focused on what’s next for transportation — with a new era comes a new vision for our transportation system and a new set of realities. The Summit featured top notch speakers and provocative breakout sessions. Keynote speaker, former Pennsylvania Gov. Edward Rendell, shared his vision for the future of the transportation system and the necessary investment the nation must make in infrastructure to maintain its global competitiveness. Rendell painted a bleak picture of America falling apart and falling behind, and then asked conference attendees to urge their representatives to support transportation investment. Of the conference attendees who took our survey, 94 percent agreed that the Summit was an effective way to highlight the transportation challenges facing our region. Respondents overwhelmingly said they liked the variety of topics and speakers as well as the opportunity to network with the industry’s leading professionals. In case you missed all the action, watch videos of the presentations, view the event photos and read the recap blog post from Marnie Primmer on our website. Over the next few months, we will feature interviews with top transportation officials at the local, state and federal levels to provide insight on important and relevant issues. 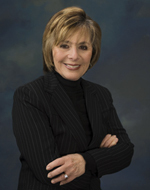 This month, Senator Barbara Boxer, Chair of the Committee on Environment and Public Works, shares her insight on the federal transportation authorization and the recent six-month extension. Mobility 21 applauds Sen. Boxer’s work to expand the Transportation Infrastructure Finance and Innovation Act (TIFIA) program. These federal loans are an important funding source for many vital projects in Southern California. M21: What is the national transportation bill and why is it so important to the transportation future of our country? SB: I have been working with my colleagues on the Senate Environment and Public Works Committee (EPW) on the upcoming transportation authorization bill, Moving Ahead for Progress in the 21st Century (MAP-21). MAP-21 is a bipartisan proposal that maintains current funding levels and modernizes and reforms our nation’s current transportation systems to help create jobs, jumpstart our economy, and provides robust assistance for transportation projects under the Transportation Infrastructure Finance and Innovation Act (TIFIA) program to leverage state, local and private-sector funding. Every dollar made available through TIFIA has historically supported a total of $30 in transportation investment. Therefore, the $1 billion of TIFIA funding in MAP-21 would leverage $30 billion in transportation projects, and would create up to an additional one million jobs nationwide. This bill is an investment in America’s future, because the nation’s aging infrastructure has not kept up with needed improvements, and now our transportation systems are falling behind other countries. According to the U.S. Department of Transportation (DOT), over 50 percent of highway miles are traveled on roads in less than “good” condition, and over 70,000 of our nation’s bridges are structurally deficient. Over the next few months, we will continue to work to move the transportation bill through the EPW Committee and the full Senate. M21:What does a six-month extension of the current bill mean to the average American? SB: The extension ensures that our nation’s transportation programs will continue operating, enabling critical transportation projects that make our roads and bridges safer to move forward. If Congress had not acted to pass this extension of the surface transportation law, then transportation programs, including construction, would have shut down across the country. Every state in the union would have been affected. There were 1.8 million highway and transit jobs at stake nationwide, and over 164,000 of those jobs were in California alone. This extension also allows more time to work on MAP-21 and move the legislation through the EPW Committee and full Senate. M21: What is at stake for the March 30 deadline if a long-term bill is not passed? SB: There is a lot at stake, including millions of jobs and our nation’s infrastructure. According to DOT, MAP-21 is estimated to create or save over 1.8 million jobs nationwide in each of the next two years, which will jump start our economy. Congress must pass this job-creating transportation bill that will put Americans back to work and build the foundation for long-term prosperity. The underinvestment in infrastructure has led to a crumbling transportation system. The American Society of Civil Engineers’ 2009 “Report Card for America’s Infrastructure” gave our nation’s infrastructure a “D.” A “D” is not the grade a world leader with an infrastructure system for the 21st Century would receive. It is time for Congress to act on this important legislation. M21: What can Mobility 21 members do to help ensure a long-term transportation bill is passed by March 30? SB: Investment in infrastructure is critical in ensuring that the U.S. can compete globally, in creating jobs here in California – and across the country – and in ensuring the safety of our families and children on our nation’s transportation systems. Making your views clear on the importance of acting quickly and maintaining current funding levels will help to ensure passage of the transportation bill. 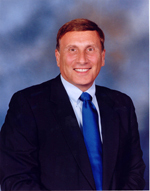 House Transportation and Infrastructure chairman John Mica (R-FL) told a group of transportation stakeholder groups on Thursday that the House Republican leadership has given him permission to seek additional revenues for the Highway Trust Fund above the excise tax receipt levels being deposited in the Trust Fund under existing law, as long as those additional revenues do not include an increase in the federal gasoline tax. The revenue decision reflects the leadership’s new desire for Mica to write a surface transportation reauthorization bill with spending levels above those approved by the House in the Ryan budget plan (H. Con. Res. 34) that the House adopted by a party-line vote of 235 to 193 on April 15 of this year. The Ryan budget called for Highway Trust Fund spending levels to be set at the maximum amount that existing Trust Fund tax receipts can support while keeping the Trust Fund from running out of money on a day-to-day basis at any time over the next ten fiscal years. And while past Congressional budget plans included a “reserve fund” allowing for increased Highway Trust Fund spending if additional Trust Fund revenues were included, the Ryan budget pointedly did not include such a reserve fund. The Ryan budget spending levels, which were incorporated in the reauthorization bill outline that Mica released on July 7, would reduce new highway and transit spending by about one-third from current levels. The spending levels in the Ryan budget and the original Mica bill outline were also incorporated by the House Appropriations Committee in its draft fiscal 2012 transportation appropriations bill. House Republican leaders privately tried to dissuade the Appropriations Committee from moving a 2012 spending bill with the lower Trust Fund spending numbers, but it would have been awkward for the Speaker or Majority Leader to publicly criticize a Republican committee chairman for writing a bill at the budget level that 235 Republican House members voted for five months previously. Mica said on July 7 that the spending levels in his bill would total $230 billion in Trust Fund spending over the six-year 2012-2017 period, consistent with the House budget plan. The latest Congressional Budget Office baseline for Highway Trust Fund programs (showing 2011 obligation levels plus annual inflation) is $325 billion over that same period, which CBO says would require about $75 billion in additional tax receipts over six years (an average of about $12.5 billion per year). According to multiple participants in yesterday’s meeting, Mica discussed finding up to $15 billion per year in additional revenues for the Trust Fund, which could allow spending totals above the current baseline numbers. (The CBO baseline projects a $41.6 billion highway obligation limitation in FY 2012, rising to $45.1 billion in 2017, and an $8.4 billion mass transit obligation limitation in 2012, rising to $9.2 billion in 2017, so $15 billion per year in additional revenues might support higher spending levels than those.) Or the extra $15 billion in taxes could allow the Trust Fund to stay solvent at baseline spending levels past the first few months of FY 2018. A. Mica’s committee, T&I, does not control any taxes. Those are the purview of the Ways and Means Committee, which jealously guards that jurisdiction. B. Most Congressional observers think that all tax-related action has to wait until after the Super Committee (formally the Joint Select Committee on Deficit Reduction) makes its report at Thanksgiving and their bill (if there is one) makes its way through Congress by Christmas. This could postpone significant revenue decisions on the House surface transportation bill until early next year. C. All of the current excise taxes supporting the Highway Trust Fund (gasoline and diesel taxes, excise taxes on new truck, trailer, and tire sales, and an annual tax on heavy truck usage) are direct taxes on users of the highway system, and the big-money taxes (gas and diesel) are directly tied to the level of road usage (the number of miles driven). Since a gasoline tax increase has been ruled out, it is difficult to see how $15 billion per year in new revenues could be derived from taxes falling solely on highway and/or transit system users. This is significant for two reasons. First of all, a shift away from a user-financed federal highway program undercuts the whole nature of the program since 1956 and might require highway funding formulas (which are now largely based on state gasoline tax payments) to be redrawn. Second, the Congressional Budget Act of 1974 tried to ban all “backdoor” spending programs like contract authority, but it grandfathered in the Highway Trust Fund so long as at least 90 percent of the Trust Fund’s outlays (spending) were supported by taxes “related to the purposes for which such outlays are or will be made”. So supporting the Trust Fund with taxes that are not related to highway and transit spending would, in theory, require the end of the whole contract authority spending process. While Congress might have the votes to override the Budget Act in this instance (it would require 60 votes in the Senate), it would at least require a public rethinking of whether or not the Trust Fund must be financed by program beneficiaries. The TIGER (Transportation Investment Generating Economic Recovery) competitive grant program funds innovative transportation projects that will create jobs and have a significant impact on the nation, a region or a metropolitan area. Mobility 21’s partners from throughout Southern California are hard at work finalizing their applications for a slice of the $526.944 million funds available to the entire nation. Mobility 21 members are encouraged to send letters to their representatives in support of Southern California’s critically important transportation projects. This project will accommodate existing and planned growth within the Imperial County region. It will also improve interregional and local traffic circulation within the City of El Centro and in the unincorporated Imperial County area south of the I-8 / Imperial Avenue interchange. With unemployment in the area over 30 percent, this construction project will help create much-needed jobs in Imperial County. The Cesar Chavez Blvd. and SR-98 Corridor will serve as the U.S. gateway to the Calexico West Port of Entry (POE). The project will reduce traffic congestion, enable passenger vehicles to efficiently enter and exit the POE, facilitate international trade and commerce, enhance pedestrian safety, reduce greenhouse gases and improve air quality in Imperial County. This project is part of the larger San Pedro Bay Ports Rail Enhancement Program which involves several inter-related projects by the Ports of Long Beach and Los Angeles, as well as the Alameda Corridor Transportation Authority. This particular project includes construction of 16,400 feet of new track, including crossovers, to provide three tracks under Ocean Boulevard with a lead track to on-dock rail and dedicated mainlines to various rail yards. This project creates 340 full-time jobs, enhances both our region’s and nation’s long-term economic competitiveness, and increase the safety, environmental sustainability, and livability of the region. This project will improve public transit service and mobility in the Crenshaw Corridor by constructing an 8.5-mile light rail transit line. This project will enhance accessibility and safety for pedestrians and motorists in the vicinity of the terminus by relocating the off-ramp from the right shoulder to the left shoulder of the freeway. The Nogales Street grade separation project will separate train traffic from car traffic along the Union Pacific Railroad mainline between San Jose Avenue and Gale Avenue in the City of Industry/Unincorporated Los Angeles County. This Alameda Corridor-East Construction Authority project will reduce congestion, air pollution and locomotive horn and crossing bell noise. The 2.2-mile San Gabriel Trench grade separation project will result in the lowering of a 1.4-mile section of Union Pacific railroad track in a trench through the City of San Gabriel with bridges constructed at Ramona Street, Mission Road, Del Mar Avenue and San Gabriel Boulevard, allowing vehicles and pedestrians to pass over the tracks. This Alameda Corridor-East Construction Authority project will reduce locomotive horn and crossing bell noise, congestion and air pollution, estimated at 213 tons/year of air toxins and greenhouse emissions by 2030. Freight trains passing through State College Boulevard in Fullerton cause delays, safety hazards, pollution and noise. Since keeping freight moving through Orange County is important to Southern California’s economic vitality, this project will separate car traffic from trains and eliminate the need for commuters and commercial vehicles to stop, wait and waste time at railroad crossings as seemingly endless freight trains pass by. The project will increase capacity and reduce congestion for an existing 14-mile stretch of SR-91 and a 6-mile stretch along the I-15. The proposed improvements will ease movement of people and goods between Riverside County and Orange County, improving travel conditions for work, recreation, school and commerce. This project of national and regional significance is a key connector from the Port of Los Angeles / Long Beach to destinations across the nation. Severe delays are common, especially during peak afternoon and weekend hours, when traffic backs up five miles. The addition of truck bypass lanes and a lane in each direction through the junction will help reduce congestion and get goods to market faster. The San Diego Association of Governments (SANDAG) and Caltrans will work in partnership to construct the SR-11 and SR-905 freeway-to-freeway connector. The Border Network Improvement Project connects SR-905 to planned SR-11 toll road to the new Otay Mesa East Port of Entry. This project replaces three aging timber trestle railway bridges built in the 1920s and 1930s in order to maintain compliance with Federal Railroad Administration (FRA) standards and support intercity, commuter and freight rail services in the second busiest rail corridor in the nation. This interchange is not only vital to the City of Ventura, but regionally impacts the contiguous counties of Ventura, Los Angeles, and Santa Barbara. The project will improve mobility and provide access to both residents and commuters locally and regionally for the purposes of employment, recreation, travel and goods movement, especially from port and agriculture producers in the area. Metro, in partnership with the Metro Gold Line Foothill Extension Construction Authority, is working to extend the existing Metro Gold Line from its current terminus in Pasadena to Montclair to provide an alternative transportation option to congested roadways. Skanska, the contractor for the Gold Line’s Iconic Freeway Structure, has focused on the creation of local jobs throughout the construction of the $18.5 million project. In the next 60 days as the project ramps up, dozens of men and women from Los Angeles, Riverside and San Bernardino counties will be at work on the project. Crews began foundation work on the project’s Iconic Freeway Structure in Arcadia in early September. By mid-December, the crew will begin setting bridge falsework. When completed in July 2012, the structure will be ready to carry the Metro Gold Line extension over the 210 freeway. 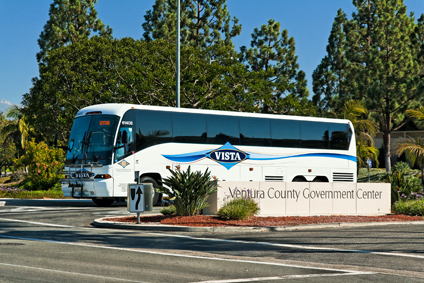 VISTA intercity bus service provides connections between the cities of Ventura County and between neighboring Santa Barbara and Los Angeles counties. Ventura Intercity Service Transit Authority (VISTA) reached a major milestone in fiscal year 2010-11, surpassing the one million-rider mark for the first time in its seventeen-year history. VISTA served a total of 802,971 fixed-route riders as well as 205,692 more through its Dial-A-Ride program. VISTA launched in 1994 with four routes and now offers six routes throughout Ventura County. Ridership has increased 16 percent each year. In January, VISTA started its free transfer program, which played a big role in reaching the landmark figure. The program works in cooperation with Gold Coast Transit, Simi Valley Transit, Moorpark City Transit, Thousand Oaks Transit, Camarillo Area Transit and Oxnard Harbors and Beaches Dial-A-Ride. Riders who purchase their bus fare can switch between transit systems without paying an extra fee. The program has grown each month. VISTA fixed routes for Highway 126, Highway 101 and the Coastal Express also saw their highest numbers to date. Overall VISTA ridership totaled 257,794 in the fourth quarter. It was the second highest ridership to date for the quarter. The I-5 is the only major artery linking San Diego, Orange and Los Angeles counties. When the freeway is at a standstill, so is Southern California. With nearly 40 million people in California, hundreds of thousands of cars, trucks and buses pack the I-5 daily. In 20 years, the population will reach 50 million and if Southern California does nothing, traffic will be unbearable. While the I-5 improvements under the Orange County Transportation Authority’s Measure M program will help ease congestion, extensive expansion along the I-5 would cost taxpayers billions of dollars and impact the quality of life for residents along the beach cities. 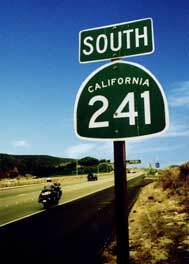 The completion of the 241 Toll Road connecting South Orange County with San Diego would be built without taxpayer dollars and create thousands of jobs. A recent economic study shows that the planned 16-mile completion of the 241 Toll Road will create 17,000 jobs in California, generate $3 billion in economic output for the state and create nearly $160 million annually in local and state tax revenue. Click here to read the economic analysis executive summary and click here to read the press release. Mobility 21 is a proud partner of the upcoming FuturePorts conference on Tuesday, Oct. 11. 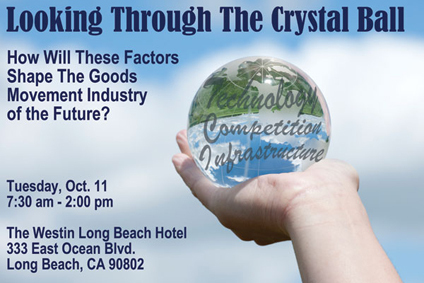 Join us as we look into the crystal ball of the future to determine what needs to be done to secure our place as the world leader in the implementation of technology, while holding off the competition and building the infrastructure needed to facilitate the efficient movement of goods through Southern California. Time 7:30 a.m. – 2 p.m.
Mobility 21 members can register at the FuturePorts member rate of $99! Enter the code “M21 2011” on the registration form available atwww.futureports.org to receive the discounted rate. At this pivotal time, innovative solutions are needed to address the environmental and public health challenges in Southern California for moving people and goods in the 21st century. With growth in urban population and goods movement, there needs to be a coordinated effort to solve the challenges of mobility, energy security, air quality, climate change and the need to create jobs. Join South Coast AQMD with leading air quality, transportation, energy, labor and policy experts to discuss innovative solutions. Join Mobility 21 and other industry organizations for an evening of networking while supporting a great cause. Proceeds benefit Orangewood Children’s Foundation, Stand Up for Kids and Olive Crest. Arnice Lamb, Supplier Diversity & Sustainability, Walt Disney Co.